Cecil was a lion living in Hwange National Park, Zimbabwe. For seven years, he wore a tracking collar from Oxford University as a participant in a study of lions. Information from the collar was sent via satellite to researchers studying the lives of lions in order to aid conservation efforts. The lion was a park favorite, observed and photographed by many visitors to Hwange. 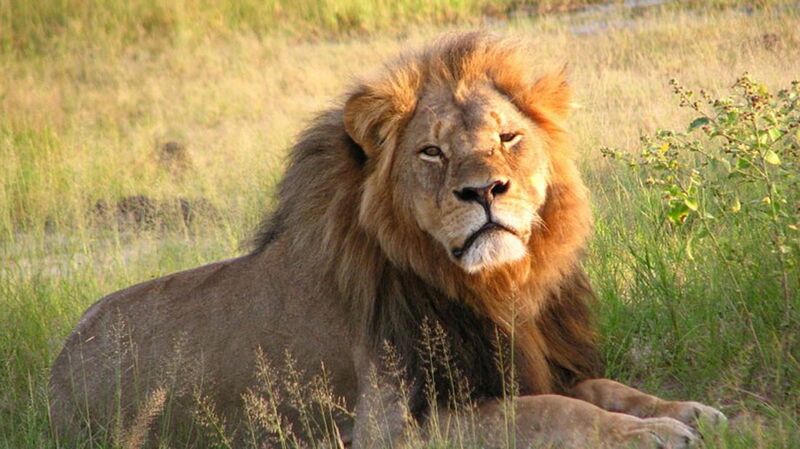 Last month, 13-year-old Cecil was lured out of the park and killed in a trophy hunt by American dentist Walter Palmer. While some regulations appear to have been circumvented, lion hunting was not illegal in Zimbabwe at the time (lion, elephant, and leopard hunting have since been banned in the area surrounding the park). Regardless of which laws were broken, the world reacted with sadness and outrage. Dr. Palmer went into seclusion as his business was picketed, and Cecil became a symbol of threatened African wildlife. An outpouring of support had brought over £550,000 in donations to the Wildlife Conservation Research Unit (WildCRU) for lion research. And quite a few artists and others were inspired to create tributes to the real-life Lion King. Minnesota artist Mark Balma was on hand at the protests in front of Walter Palmer’s dental office, staging his own kind of protest. He set up an easel in the parking lot, pulled out the paints, and painted Cecil’s portrait right then and there. Balma has received quite a few offers for the painting. When he sells it, probably by auction, proceeds will go to WildCRU. Signed prints will also be available. That sentiment is echoed in the creation of many of these artistic tributes. Belgian street artist DZIA painted a few murals in Glasgow, Scotland, over the past week, and a couple of them featured Cecil the lion in all his majesty. See more Glasgow wildlife by DZIA at StreetArtNews. Artist Aaron Blaise was an animator on the movie The Lion King. He was upset at the news about Cecil and was inspired to paint him in a manner reminiscent of Mufasa in the sky. You can see a time-lapse video of its creation at Blaise’s blog. Ty Warner has announced that Ty, Inc. will produce a Beanie Baby lion named Cecil as a tribute to the late Zimbabwean lion. All profits from the sale of the plush toy will go to WildCRU. A Facebook community called Cecil the Lion sprung up to commemorate the cat’s life and memory. They recently launched a project called Selfies for Cecil, inviting supporters to send in selfies with the hashtag #CecilLives. You are invited to submit selfies, showing a landmark or scene from your town. You need to hold a homemade creative sign INCLUDING BOTH the “#CecilLives” hash tag and your town/ country in your selfie. The selfies will be incorporated into a video on the www.CecilTheLion.org website and Facebook page and will be sent to our media contacts in advance of WORLD LION DAY August 10, 2015. We want to show the world who you are. You are Cecil: You are his spirit. Selfies must be submitted by August 6 to be included in the video. The Cecil the Lion Facebook community has received artistic tributes to Cecil from all over the world. From Joery in The Dominican Republic. From Daniel in Monterrey, Mexico. From Luccas in Sao Paulo, Brasil. The Oceanic Preservation Society and the filmmakers of the documentary Racing Extinction collaborated to bring a light show to the Empire State Building on Saturday night. For three hours, images of 160 species of threatened animals were projected onto the building, including tigers, lemurs, manta rays, and Cecil himself. See pictures of the event at HuffPo. Cecil has also been honored in editorial cartoons, video, and tears.